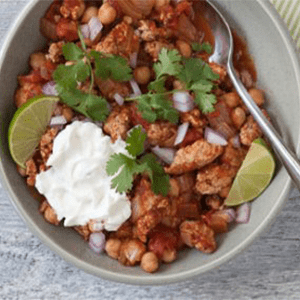 This easy weeknight chili is low on prep but big on flavor, in large part thanks to harissa powder, a fiery Tunisian blend of red chile peppers, cumin, coriander, paprika, caraway and salt. 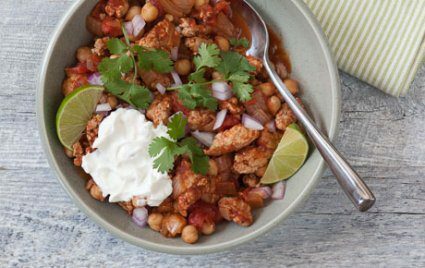 Try serving it with your favorite chili toppings such as fresh cilantro and diced red onions. Combine turkey and onion in a large skillet. Place over medium heat and cook, stirring frequently and breaking up turkey with the side of a spoon, until turkey has released most of its moisture, about 10 minutes. Raise heat to medium-high and cook, stirring constantly, until turkey and onion begin to brown, 3 to 4 minutes more. Stir in harissa and cook for 1 minute. Stir in chickpeas, tomatoes and salt. Bring to a boil, lower heat, cover and simmer until flavors blend, about 5 minutes. Serve with harissa on the side for diners to add to taste. Serving size: about 1 1/4 cups, 190 calories (25 from fat), 2.5g total fat, 35mg cholesterol, 240mg sodium, 20g carbohydrates, (5 g dietary fiber, 5g sugar), 26g protein.